Learn about A Plus Warehouse wire partitions. Safety is always first priority at A Plus Warehouse. When dealing with dangerous machinery a wire partition is highly suggested. This keeps people away from where they shouldn’t be. If every civilian were smart enough to stay away from dangerous machinery than a customer wouldn’t need wire partitioning. However, unfortunately, some people may be unaware of the dangers of machinery. What better way to say this is dangerous than to have wire partitioning? Having a wire partition also keeps criminals away. For example, wire partitioning can be put around valuables. The only way a criminal is going to get at those valuable is by attempting to break the wire partitioning. This will cause much commotion. 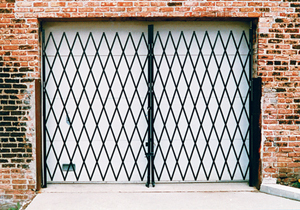 Thieves will likely not try to steal an item protected by wire partitioning. The complete wire partitions system is probably the best wire partition system around. The item is extremely simple to assemble. A customer’s 10 year old child could assemble the item. The wire is a sturdy 2” X 1” X 10 GA. The item is ideal for machine guarding, tool rooms, and isolated areas. 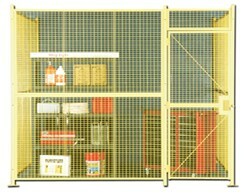 Cages are also equipped with a 3 ‘ W X 7’H single hinge door. Padlock lugs are all interconnecting hardware. This item is available in several different sizes designed to meet the needs of any customer. They also allow for maximum flexibility when relocating or expanding. Customers should order theirs today.